12-15-01: Final course grades are posted on the grades web page. 11-30-01: Project #5 is now due on Wednesday, December 5. Monday, December 3 is a "lab" day. 11-28-01: The final exam is Friday, December 14 at 4:30-6:20PM. 11-12-01: Project #5 is due Monday, December 3. 11-12-01: Test #3 is Wednesday, November 28. 10-17-01: Project #4 is due on Friday, November 2. 10-10-01: Test #2 is Friday, October 26. 9-23-01: Project #3 is available on the projects web page. This project is due Friday, October 12. 9-11-01: Dr. Goad will be teaching class on Friday, September 14. Attendance is not required. Dr. Goad will be available to answer any questions that you may have on Project #2. 9-10-01: Test #1 is Wednesday, September 26. 9-7-01: Project #2 is available on the projects web page. This project is due on Wednesday, September 19. 8-31-01: I was just checking the message board and noticed that there were some messages which I did not receive an e-mail (from the message board) automatically notifying me of a new posting. Until I figure out what happened, note that you may not receive automatic e-mail notifications! This is the first time that I used this particular message board system so there may be still some "bugs" left in it. 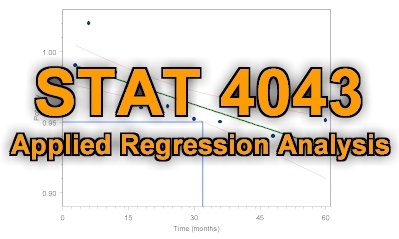 8-16-01: Welcome to the STAT 4043 website! Look for important class announcements here throughout the semester. This website was last updated on December 2001.